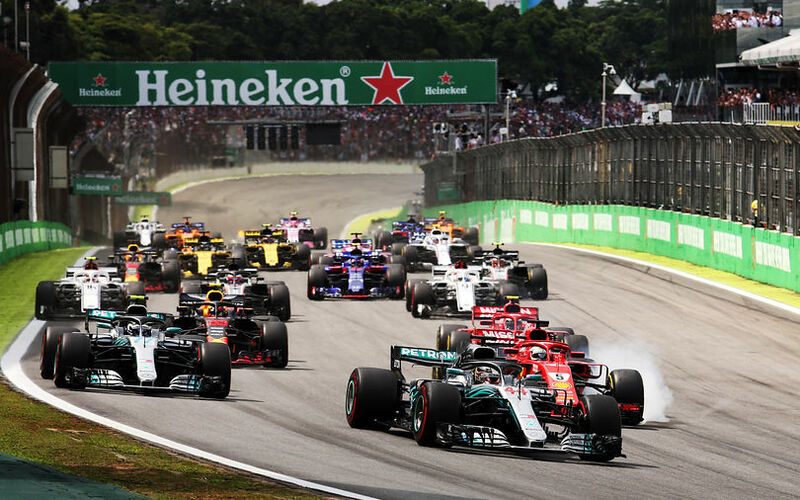 Lewis Hamilton has won the Brazilian Grand Prix, but it wasn't until Verstappen spun due to contact with a backmarker that he took the lead to victory. Verstappen ended a furious second, narrowly ahead of Raikkonen and Ricciardo. Despite a troubled start for the warmup lap for Vettel, all cars got off the line well, but it was Bottas who made the best effort as he managed to get past Vettel round the outside of Turn 1. This immediately positions both Mercedes in front. Marcus Ericsson and Sergey Sirtokin has the worst starts, losing three positions, with Leclerc dropping one more on the straight at the end of lap 1. Magnussen, who started on new softs, dropped down to 11th. At the start of lap 3, Max Verstappen gained a perfect slipstream behind Raikkonen's Ferrari and got past the Finn. In fact, one lap later, Verstappen outbraked Vettel for third, with the latter even losing fourth to his team mate later on in the lap after going a bit wide through Turn 5. Meanwhile, Daniel Ricciardo was making Red Bull's race even better, as by lap 5, he had moved up into 6th position. The Renault team on the other hand endured a scare when both their cars touched each other just ahead of the final corner. Sainz was challenging Hulkenberg for 13th, but the latter strangely deviated left, making them bump tyres. Hulkenberg subsequenty locked up under braking for the corner, and thereby lost the position to his team mate. By lap 8, it seemed like Ferrari's soft tyres caught up with the degrading performance of the super softs on the Red Bull and Mercedes cars. The Ferrari cars easily caught up with Verstappen, and when the Dutchman eventually got past Bottas on lap 10, Raikkonen was immediately in attack mode on the Finnish Mercedes driver. Bottas really needed everything to keep Raikkonen behind during lap 11 while Verstappen set off to chase Hamilton. As Bottas lost ever more time, Ricciardo was happy to catch up with that train as well. For Magnussen, his start op softs also payed off as he moved up from 11th after lap 1 to 9th on lap 14. Though at the time, he was 7.5s down on his team mate in 8th position. By lap 16, Hamiton still held about 1.5s in hand on Verstappen, but Bottas couldn't keep up, and already lost 7s to the reace leader. Raikkonen, Vettel and Ricciardo seemed faster, but Raikkonen repeatedly failed to make moves stick, despite coming aside of the Mercedes several times. On lap 18, Bottas pitted as blisters on his rear tyres increased. The Finn switched to medium compound tyres, and rejoined the track in 9th position. One single lap later, Hamilton pitted as well, as he similarly started to struggle with the right rear and left front tyres. He rejoined in 7th, also with the medium tyres. The move unleashed Verstappen, enabling him to immediately set the fastest lap, followed by an even faster lap by Hamilton in his fresh tyres. At the same time, the latter passed Grosjean for 6th. Hamilton passed Leclerc for 5th three laps later, putting him 5s down on Ricciardo, before a sluggish lap that saw him lose 2 seconds. On lap 27, Vettel pitted - switching to mediums, and immediately allowed Ricciardo to set the fastest lap. With a 1:12.919, he only did 0.011s better than Hamilton who continued his chase. Verstappen and Raikkonen, the only men ahead of them, were around 6 tenths slower that lap. At the back, Ericsson retired after spinning and dubbing the car undriveable. This left both McLarens at the very back of the grid. Still, they didn't seem too unfazed, as on lap 31, Vandoorne passed Alonso on the straight, before being passed again ahead of Turn 4. The next lap, Vandoorne did it again, this time without allowing Alonso to get past again. The orange duo at the time ran 5s behind Stroll. They were however slower at the time, so little chance to make up any ground any time soon. When Raikkonen pitted on lap 32, he rejoined behind Vettel, once again helping to form a train behind Bottas who seemed to enjoy leading the Ferrari drivers. 2 laps later, Vettel moved aside to allow his team mate to have a go at the Mercedes driver. Three laps later, Verstappen pitted from the lead and rejoined in between the McLaren's, in third place, 3 seconds down on Hamilton, who himself was 10s down on Ricciardo who ended up to be the new race leader. That didn't last long though, as Ricciardo pitted two laps later and returned to the track in 6th, just behind Vettel. Verstappen on the other hand rapidly closed the gap to Hamilton and passed the Mercedes on lap 41, much to the pleasure of the Red Bull mechanics. Three laps later, that reversed again, thanks to Esteban Ocon, who optimistically tried to unlap himself. He did get past on the straight, but come Turn 2, Verstappen turned in as Ocon didn't want to back off, sending both into a spin and handing the lead back to Lewis Hamilton. In defence of Ocon, he latter was probably faster on his new super softs, and he can claim Verstappen didn't leave him any space, but then again, Verstappen was always going to be favoured being the race leader. Moments later, Ricciardo made a move stick and passed Vettel for 5th, on his was to Bottas who lost his third position to Raikkonen. On lap 53, with just 17 laps left, Vettel pitted to change to used super softs. As the threat of rain remained, Hamilton went on with obvious blistering on his tyres while Verstappen continued to slowly close the gap again, down to 3.8s at the time. As Vettel passed Leclerc to get back to his 6th position from before his stop, Ricciardo eventually passed Bottas for 4th. 2 laps later, the Finn pitted, changing to softs - lacking any new sets of super softs - for the final 10 laps. Bottas returned to the track in 5th, but just 1.5s ahead of Vettel, but went on to sharped the lap record a few times to increase his advantage on the Ferrari driver. Fruther back, Stoffel Vandoorne is making strides, passing Stroll and then Sirotkin. the stop-and-go penalty for Ocon then helping him to gain another position into 14th, having started the race from 20th. His team mate, Fernando Alonso, had meanwhile switched to a new set of super softs . As the race came closer to its end, the gaps at the front decreased while they were all fighting their way through backmarkers, who on their behalf were still also very much involved in battles. 3 laps from the end, Hamilton had 1.7s over Verstappen. Raikkonen was another 2.8s further down, chased by Ricciardo at half a second. Despite the small gaps, the tyres held on, and positions stays the same at the front. The result also secures Mercedes as the Constructors World Champions of 2018.